Home » TRAIN Package 2 What Is It? Home » Government » TRAIN Package 2 What Is It? TRAIN Package 2 What Is It? I hear a lot about this TRAIN package 2. So I decided to read about it and find out for myself what it is. TRAIN is an acronym. 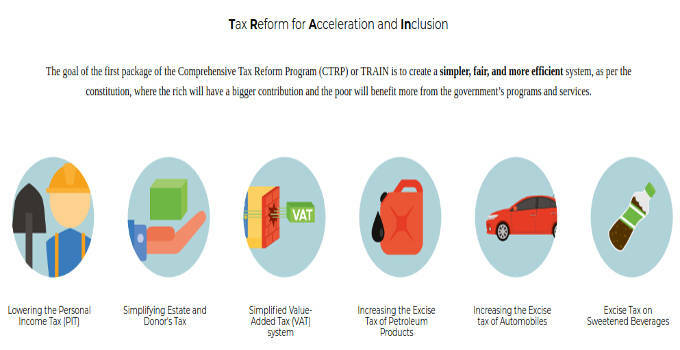 It simply means Tax Reform For Acceleration and Inclusion. TRAIN is a law. It is a tax law and not a form of rail transport like MRT or LRT. There is a law called TRAIN Law package 1. It took effect this year, 2018. The purpose of the government in doing this is to help the low-income Filipino workers increase their take home pay by paying less income tax or no tax at all. The Tax Law is also intended to raise additional revenues through the repeal of several non-essential exemptions to the value added tax (VAT), adjustments in the excise tax rates for fuel, coal and automobiles and tax on sugar sweetened beverages among other measures. These additional revenues can be used by the Philippine government for infrastructure and social services. Now comes the TRAIN Package 2. TRAIN Package 2 is not a law. Not yet. Not yet in the sense that it is just a bill passed in the congress of the Philippines. A bill becomes a law only when it passes the congress of the Philippines and signed by the President. What is the aim of this TRAIN Package 2? What will it do once it becomes a law? TRAIN Package 2 will basically lower the corporate income tax. You know, those taxes paid by corporations. TRAIN 2 intends to lower the corporate income tax rate from 30 percent to 25 percent. This bill seeks to attract more investors. The Philippine law makers hope to pass the TRAIN 2 package within the year. I hope that President Duterte’s vision to correct a number of deficiencies in the tax system to make it simpler, fairer, and more efficient will succeed.